THIS FEATURE CONTAINS SPOILERS FOR ‘THE FEARSOME DOCTOR FANG’, ‘THE SEVEN DEADLY SINS’, ‘GOODNIGHT, PARADISE’, AND ‘SARA’. by Clyde Hall and Jarrod Jones. It was early in December 2018 that TKO Studios seemingly dropped out of the sky to challenge the way we read comics. This was a publisher with a difference: brash, yes, well-founded, definitely, but TKO had enough wherewithal as a potential powerhouse to keep its opening salvo a closely-guarded secret in the industry (for longer than most of us might realize), and they managed a marketing strategy that we’re sure caused its newfound competition to take note. We’re still feeling the shock waves two months later. TKO described itself as a “modern comics publisher”, and they meant it. Their initial launch sent readers and bloggers and comics press scrambling to get their bearings; they didn’t simply launch with a single series and let potential reader interest wane over each successive release, they dropped four titles in our collective laps, complete, ready to purchase in whatever format we so desired. Those four titles—The 7 Deadly Sins, Sara, The Fearsome Doctor Fang, and Goodnight, Paradise—boasted marquee names that signaled TKO meant business from the start, and a genre-minded sensibility that would fit on the shelf alongside other publishers such as Vault, AfterShock, or even Image. Clearly, a force to be reckoned with. For the first installment of HOT PRESS, a new DoomRocket feature that zeroes in on a single publisher and a smattering of their strongest content, we decided to finally catch up with TKO to see if their output lives up to, or even surpasses, their hype. THE TEAM: Written by Tze Chun and Mike Weiss, art by Dan McDaid, colors by Daniela Miwa, letters by Steve Wands. Tze Chun is a co-founder and publisher for TKO Studios. Also, a painter, a visual artist, and has been a staff writer for ABC’s Once Upon a Time. He is currently a writer and co-producer on the Gotham TV show. Mike Weiss is a writer and producer living in L.A. Prior, he spent a decade in New York’s animation industry as a writer and producer. Dan McDaid is a British writer and artist. He’s applied his artistic talent to Jersey Gods for Image, Captain Victory and the Galactic Rangers at Dynamite Entertainment, Judge Dredd: Mega-City Zero at IDW, and currently works on the BOOM! Studios series Firefly. Daniela Miwa has colored Dynamite’s Doc Savage series, Doc Savage: Ring of Fire #1, and The Shadow 2013 Annual. In addition: Shaft, Battlestar Galactica Vol 3, and The Greatest Adventure, The Old Guard: Opening Fire (Image) and Ghost in the Shell: Global Neural Network (Kodansha Comics). 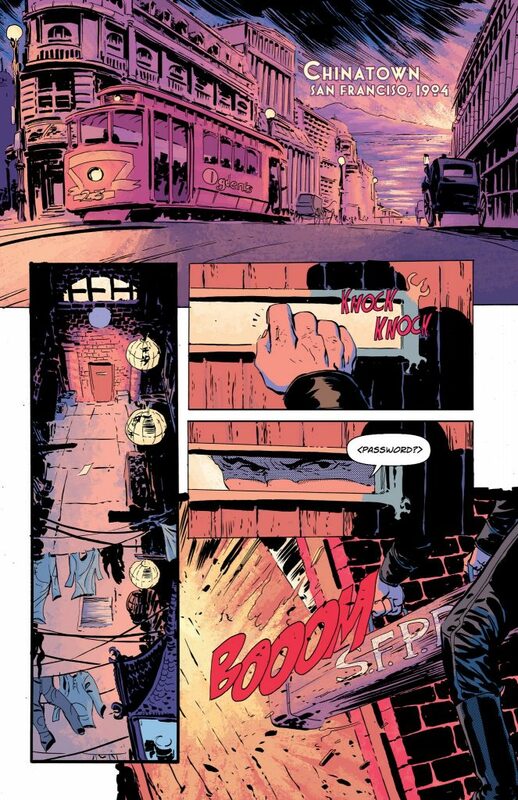 Letterer Steve Wands’ work includes Batman, Batman Eternal, Gotham Academy, American Vampire, and FBP for DC and DC Vertigo; Adventure Time, Dead Letters, Memetic & others for BOOM! Studios; Attack on Titan for Kodansha USA/Random House. THE GIST: The global engine of Evil has one masterful architect: The Fearsome Doctor Fang! The strings of his nefarious network stretch into every nation. SFPD beat cop Nayland Kelly and treasure-hunter Alice LeCroix have their reasons for pursuing Fang, and eventually the three form a loose alliance as they chase an even greater threat across exotic locations. 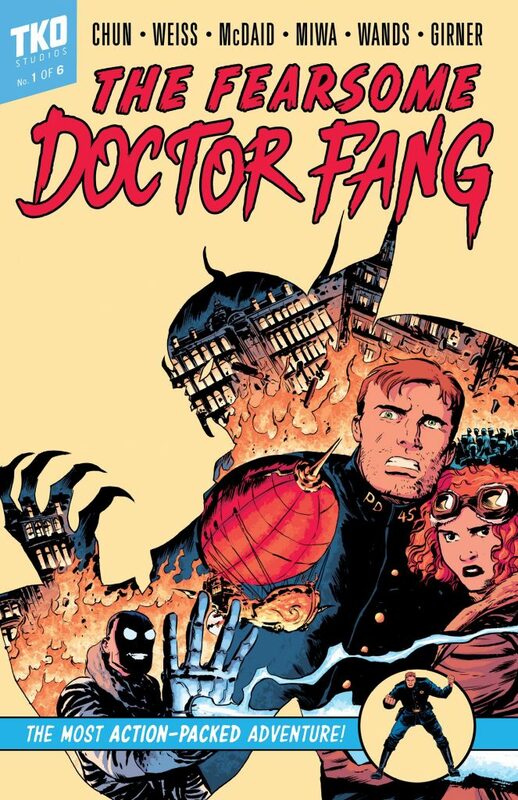 WHAT WORKS: The Fearsome Doctor Fang maintains its pulpish quality while not falling prey to most of the genre’s foibles. All the characters make errors and are fallible. The heroes represent different races and genders. The device of an amazing individual setting up a criminal empire to serve the cause of justice (an element of the Green Hornet approach to crime fighting) is handled appealingly here. It’s shuffled in with the classic pulp villain-protagonist angle—Dr. Fu Manchu, Doctor Satan, the Doctors Death. Apparently, Doctorate of Evil Science is a prerequisite to be a villain-protagonist, and Doctor Fang has his sheepskin. The three main characters each display moments of brilliance, stubborn determination, and cooperation as they become a formidable team. The main villain of the piece, Clifton Church, is equally challenging and capable of hanging each of our heroes separately if the trio fails to hang together. Unlike some of the pulp literature on which Fang is based, a triumphant outcome is not a foregone conclusion. After all the heroes have gone through, its ending is optimistic and that feels right. 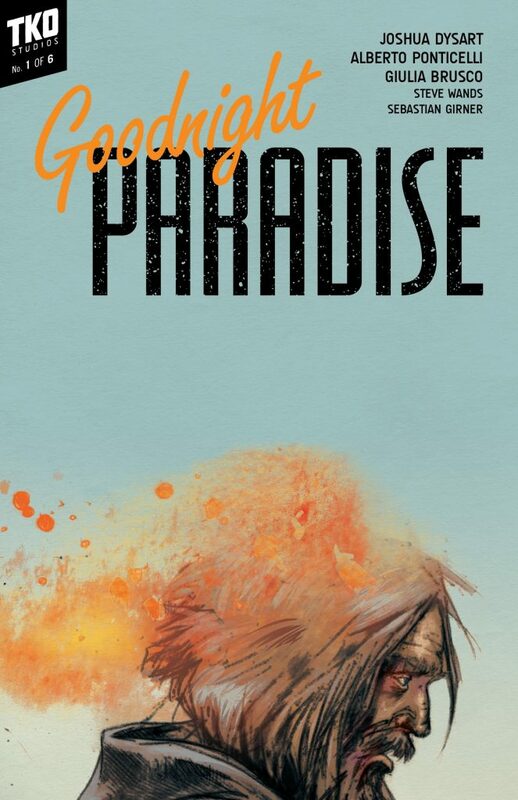 A recent comic pulp series I read was beautifully done, yet somehow did not stick the landing. Missed the whole runway. Points for The Fearsome Doctor Fang’s ability to do so. DEFINING MOMENT: Fang realizing he is, in fact, a hero. Crediting his companions with showing him that path and embracing them as the family we make. When he acts on the attraction between himself and Alice, it ignites the warm afterglow this title leaves the reader to enjoy. IS IT A TKO? More a Corner Retirement. A fighter quitting due to injuries suffered over a foul sometimes results in a decision sent to the scorecards. Does the series win? Yes. But. Pulps are not easily translated into comics form. For all the coolness of DC’s First Wave, (Doc Savage, the Spirit, Pulp-Batman, the Blackhawks, the Avenger, Rima) it also shared this outcome. Despite some wonderful splash pages, the first issue wouldn’t have led me to buy the entire set. A mistake on my part, but an integral factor in how TKO does business. We get insights about Fang, but little on how he got such wonderful toys. They at times transcend Steampunk for the 1906 setting. A few items break the suspension of disbelief by appearing more akin to 2004-2006, and those moments stopped the narrative in its tracks for me. THE TEAM: Written by Tze Chun, art by Artyom Trakhanov, colors by Giulia Brusco, and letters by Jared K. Fletcher. Tze Chun is a Los Angeles-based writer and producer on the Fox television series Gotham, which is currently in its fifth and final season. He wrote and directed the 2013 film Cold Comes the Night, which starred Alice Eve and Bryan Cranston. As a first-time comic creator, he factors in the launch of TKO Studios’ opening salvo in a huge way as the writer of The 7 Deadly Sins and co-writer of The Fearsome Doctor Fang. He’s the co-publisher of TKO. Artyom Trakhanov is an artist based in Russia. He’s best known for his work on Image Comics’ Overtow with Steve Orlando and BOOM! Studios’ Turncoat with Alex Paknadel. Giulia Brusco is a colorist currently living in London. Her 18-year career has spanned many high-profile projects, including Scalped and The Goddamned(both with writer Jason Aaron), Vertigo’s adaptation of Stieg Larsson’s The Girl With the Dragon Tattoo, and most recently a run on DC’s Batman. She also colored TKO’s Goodnight, Paradise. Jared K. Fletcher is a prolific letterer who has worked in the comics industry for nearly thirty years. He has applied his talents to countless titles spanning the breadth of mainstream comics, including American Vampire, Detective Comics, Young Liars, and Air. He is also responsible for the striking trade dress and company aesthetic that spans TKO’s entire line. THE GIST: A crew of violent death row inmates are busted out of the hoosegow by a man with a hidden agenda, who inadvertently leads them down a bloody path of revenge and retribution. WHAT WORKS: The Western is notorious for its bleak worldview and liberal use of bloodshed, and it is those two attributes that most define The 7 Deadly Sins. Relentless from the start, the series finds new creative ways to ratchet up the violence with every chapter, which makes the dread that follows the book’s titular seven hang in the air thick as gunsmoke. Tze Chun has a clear passion for the genre, considering he chose this project as his first solo comics outing. There’s a confidence in the book’s set pieces; he shifts from rousing action to still moments with the well-oiled precision of a Smith & Wesson Model No. 3. He displays an affection for the late-Sixties oater, particularly the spaghetti Westerns of Leone and the hard-scrabble ensembles of Peckinpah and Sturges. Prospective film studios looking to tap into the TKO vein would mine rich ore from Sins. That’s due in even larger part to the efforts of Artyom Trakhanov and Giulia Brusco, who knock out a staggeringly great display of craft and energy. Trakhanov’s characters are hard-edged bastards even with the artist’s squiggly linework; each member of this motley crew has their own distinctive identity which conveys years of heartache and woe. And his dramatic pacing? Absolutely worthy of study. 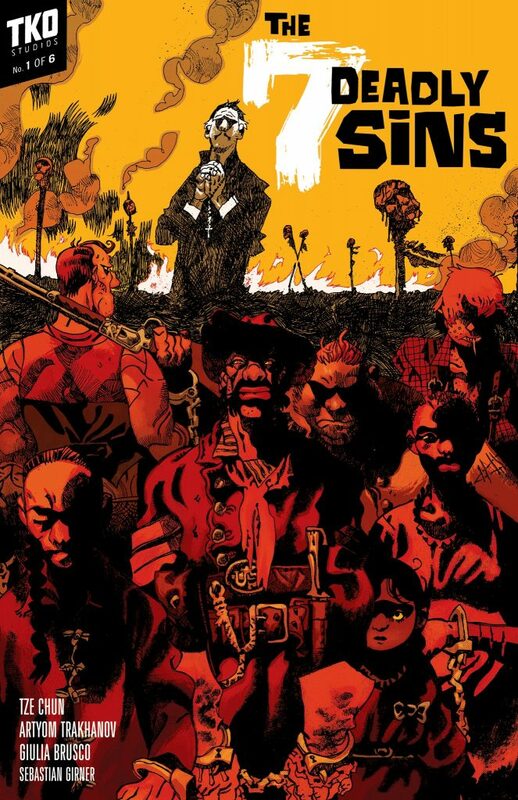 Brusco’s colors ignite on the page to the point where you can damn near feel the Texas sun burn into the flesh of Sins‘ cast of outlaws. There’s so much brawn put into this yarn that you get the feeling each moment is under direct threat of ending in massacre. DEFINING MOMENT: The 7 Deadly Sins is an uncompromising book in vision and execution, and no moment encapsulates that more than in issue #4. It’s here where we learn the crushing backstory of Malene, a freed slave who’s been convicted for the deaths of her former slaveowners, trying her damndest to survive carrying a child that’s millimeters away from entering this world. Who she is, and how she’s survived in a brutal world still cooling from the decimation of the Civil War is harrowing enough. How her story ends will stay with you, for better or worse. IS IT A TKO? I’d reckon so. Reading through The 7 Deadly Sins in one go is a gauntlet of horrors and delights (I read a digital copy of the trade collection), but it also puts its weaker aspects under a higher level of scrutiny. Some of it holds up under that level of heat, and some of it does not. One respects the attempt to make the anti-heroes of The 7 Deadly Sins eponymous in nature; each character is designed to reflect one of man’s most ancient and most odious of trespasses, yet there isn’t time enough to properly appreciate all these characters, let alone all the various other malefactors who blunder into their gun sights. We’re often treated to scads of exposition to keep pace with the story’s momentum, and Chun paints most of his characters with the broadest of brushes. That makes for a few unfortunate traipses into stereotype, and for a cast as diverse as this, those at-times cartoonish characterizations stand out a mile. THE TEAM: Written by Joshua Dysart, art by Alberto Ponticelli, colors by Giulia Brusco, letters by Steve Wands. Joshua Dysart, a multiple Eisner-nominated comic book writer, has done work for DC Vertigo (Unknown Soldier, Swamp Thing), Dark Horse Comics (BPRD), Image Comics (Violent Messiahs), Valiant (Harbinger), Dynamite/Liquid Comics (Buddha: A Story of Enlightenment), and IDW Publishing (Lamenting Pain). 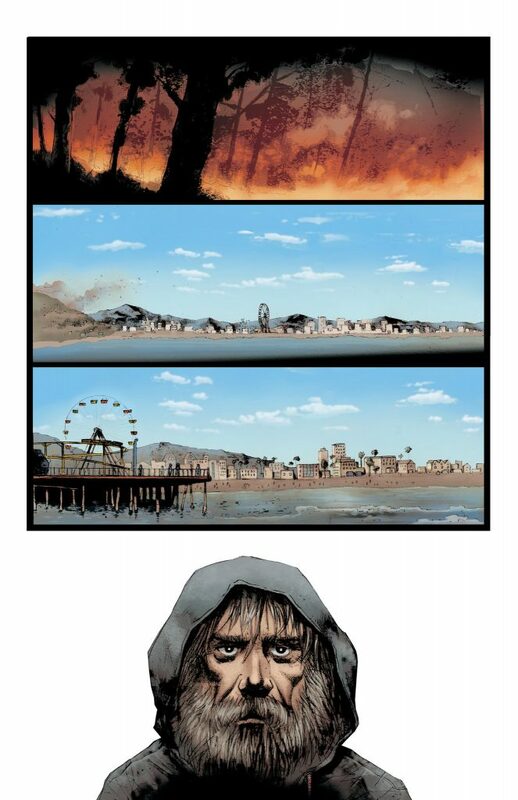 Eisner-nominee Alberto Ponticelli’s art has been featured at Marvel (Marvel Knights Vol. 2, Blade II: Bloodhunt), Image Comics (Sam and Twitch), Dark Horse Comics (Egon), and DC (Batman: The Dark Knight, Unknown Soldier, Dial H, Frankenstein: Agent of S.H.A.D.E.). 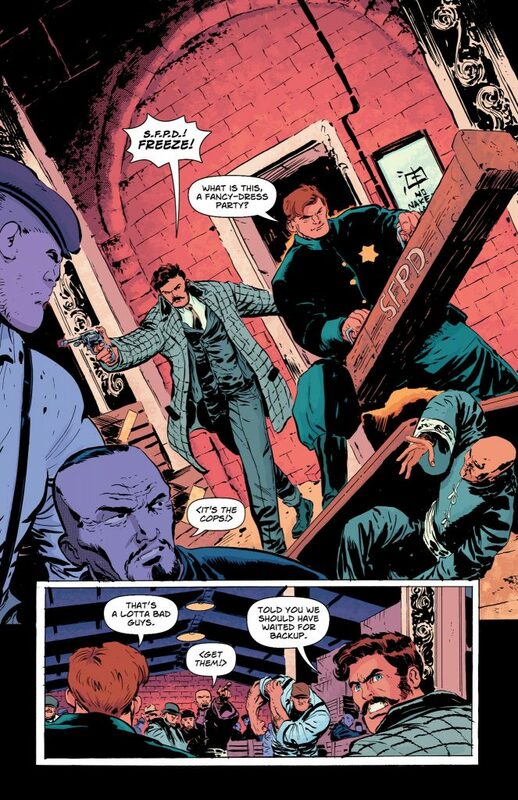 Giulia Brusco’s colors have graced titles at DC Vertigo (Scalped, Saucer Country), DC (Detective Comics, Batman Vol. 3, Batman Eternal), and Marvel (Punisher Vol. 7, Marvel Illustrated: The Picture of Dorian Gray, Thor: God of Thunder Vol. 1). She also colored TKO’s The 7 Deadly Sins. Letterer Steve Wands’ work includes Batman, Batman Eternal, Gotham Academy, American Vampire, and FBP for DC Comics and Vertigo; Adventure Time, Dead Letters, Memetic & others for BOOM! Studios; Attack on Titan for Kodansha USA/Random House. THE GIST: A homeless teen is found murdered near the beach of Venice, CA. The crime’s chalked up to the danger of runaways living on the street, and authorities begin looking halfheartedly for a suspect. But another member of the beachfront homeless community can’t quite let the incident go. Plagued by dreams compelling him to discover the truth, Eddie begins to actively seek the ones responsible for this young woman’s death. WHAT WORKS: Dysart draws stark contrasts between the men, women, hood rats, free spirits, disenfranchised, addicts, longtime residents, and mentally ill drawn to the beauty of the beach, and those monied interests grabbing up real estate. It mirrors reality; obscured references are made to a business that rhymes with Splatkat, one that bought up a lot of Venice beachfront despite gentrification protests. Those conflicts become an integral part of the story. In fact, Venice, CA becomes a character, complete with backstory. If the players of this melodrama must live in hellish conditions, willingly or as dictated by emotional instability, addiction, or circumstance, they’ve chosen a heavenly location for it. Venice casts its sunny influence over these dark doings like a perky version of Sam Spade’s San Francisco. The Venice homeless community, the way the people speak, how they relate to one another whether bickering or bonding, how they survive, is made utterly believable. The reader gets an insider’s view through this series. It may make you want to bathe in Purell, but it grants insight to their friendships, heartbreaks, and hopes. You’re left wanting to know the eventual fates of secondary characters like B.F. Bob, the diabetic friend who lives in a camper van, no longer gets his insulin through his caseworker, and has a festering foot ulcer. Friday the wrong-way guy. Hogan, the beach vendor who’s doing what he can to help his neighbors and bring attention to their plight. Josie, a young woman living in a sketchy $200 a month shelter but who sees and shares Eddie’s decency. Three teen runaways from very different backgrounds who briefly form the loving family none of their homes ever provided. Eddie is the least likely of heroes. Arthur Miller offered, “A character is defined by the kinds of challenges he cannot walk away from.” If that’s so, Eddie has a lot of personal challenge retreats for definition. Dysart spares no warts in outlining his protagonist’s shortcomings. Eddie’s unwashed. Incontinent. Delusional. Unmotivated. Constipated. Unreliable. 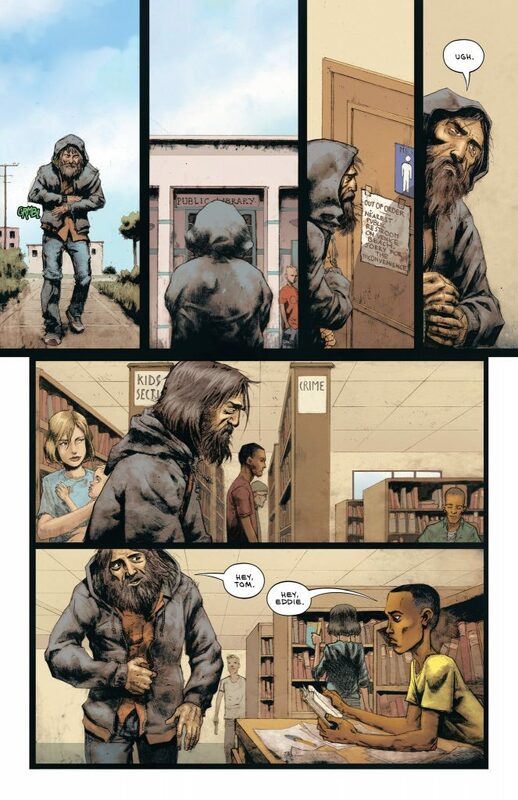 But despite his demons, despite all flaws, despite an uncaring world that’s chipped away at him, Eddie’s got a decency that cannot be extinguished. The fact that a runaway named Tessa was killed, her corpse tossed into a dumpster like an empty soda can, eats at him. He tries, but he can’t let it be and he can’t walk away. Eventually, we see how deep that decent core runs though Eddie. It means there’s hope for us all, everyone. DEFINING MOMENT: Eddie Quinones sitting on the beach, watching the sunrise, with an empty backpack. IS IT A TKO? It is. If the story was a boxing match, it would be a display between a small, pitiful palooka named Eddie and a giant bareknuckle brawler with a handgun stuck in the waistband of his trunks just in case. He doesn’t plan for his prey to exit the ring without a toe tag. After being on the ropes for most of the rounds but refusing to forfeit, Eddie’s reduced to a bloody mess. The giant closes in for the kill but slips on his victim’s blood, takes an odd-angle header onto the canvas, and breaks his own neck. Eddie crawls over so his attacker doesn’t die alone. Then he divvies his purse with everyone in the crowd. THE TEAM: Written by Garth Ennis, art by Steve Epting, colors by Elizabeth Breitweiser, letters by Rob Steen. Garth Ennis, as you well know, is an Eisner-winning writer who has worked in the industry for thirty years. Dan Dare, Preacher, Hitman, The Boys, Punisher. Most recently he’s been making our hair stand on end with Goran Sudžuka over on AfterShock Comics’ A Walk Through Hell. Steve Epting’s nigh thirty-year career has spanned several high-profile projects. Highlights include Velvet (with Sara colorist Elizabeth Breitweiser), Batwoman, and a career-defining run on Captain America. Elizabeth Breitweiser has been working in comics for just over a decade. Her works include the critically-acclaimed runs on Outcast, The Fade Out, Kill or Be Killed, and Velvet (with Sara artist Steve Epting). Rob Steen has lettered comics for sixteen years for several major publishers such as Marvel, DC, and Dynamite. His most recent offerings include AfterShock’s A Walk Through Hell and Jimmy Bastards (both with Garth Ennis). WHAT WORKS: Sara is a master class in comics storytelling. A carefully considered, impeccably researched war story that challenges wartime jingoism and suggests that it’s in war’s many fleeting, violent, seconds that we either find our humanity or lose it completely. I find it tempting to consider Sara a zenith of this creative team’s careers. A triumph. 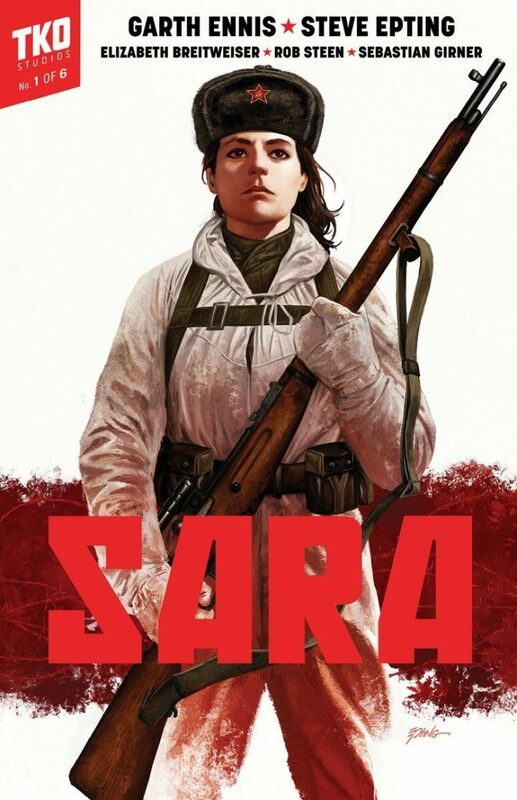 Ennis is comics’ premiere armchair war historian, and while I’ve found other examples of his history-centric output to be more grounded in detail than drama, Sara meets both halfway. 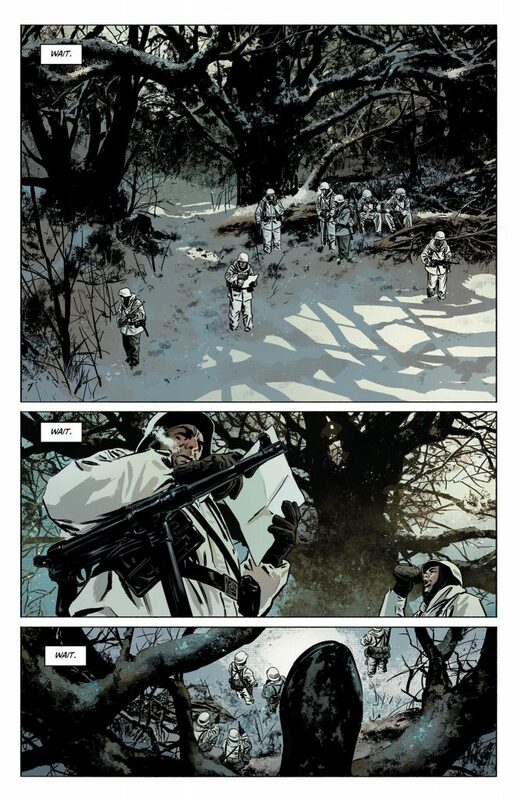 The book is especially impactful in what it wants to say about bureaucracy, war, and national identity largely because Ennis shifts his wartime storytelling gears away from the typically hyper-masculine voices we often find in such fare. These female characters aren’t simply proficient at their duty, they’re allowed to be flawed, make mistakes, jeopardize the safety of their comrades in a way you just don’t see very often—or at all, really—in historical war comics. 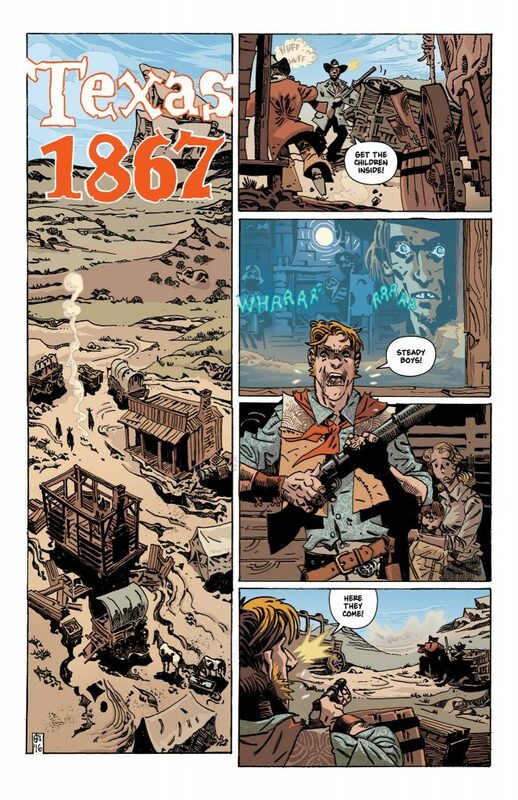 Epting gives Ennis’ acute period detail the same stone-faced approach. Gear, weaponry, and environments are illustrated with precision, and provide our reading a this-is-happening immediacy. 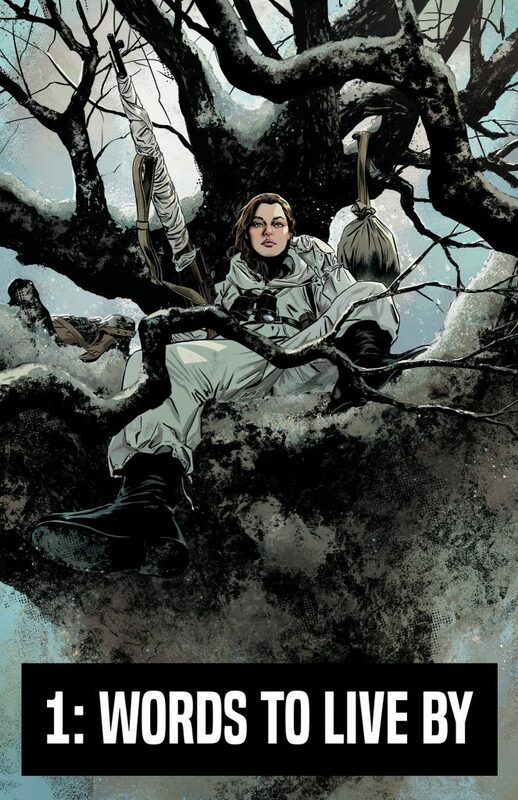 More, Epting gives us something both beautiful and frightening—he gives us Sara’s eyes, lets us peer through the scope towards her intended targets. Breitweiser uses these battle environments wisely, which underscores the feeling of a sniper’s isolation so effectively that you might find yourself scanning the various treelines to see if she included the subtle glint of an enemy’s scope. Whether your eyes move across the slate-grey skies, or widen at a sudden burst of crimson, you constantly feel your breath catch in your chest. In a comic where the vapor of a released sigh makes all the difference between dying and fighting another day, it’s an exhilarating feeling. DEFINING MOMENT: The last stand of Mari and Nata. Word of the Nazi sniper has forced Sara’s team to cast too wide a net, and Mari and Nata find themselves vulnerable to a swift foot soldier onslaught. Sara picks off as many as she can from her vantage point, but not before the enemy is on her comrades. 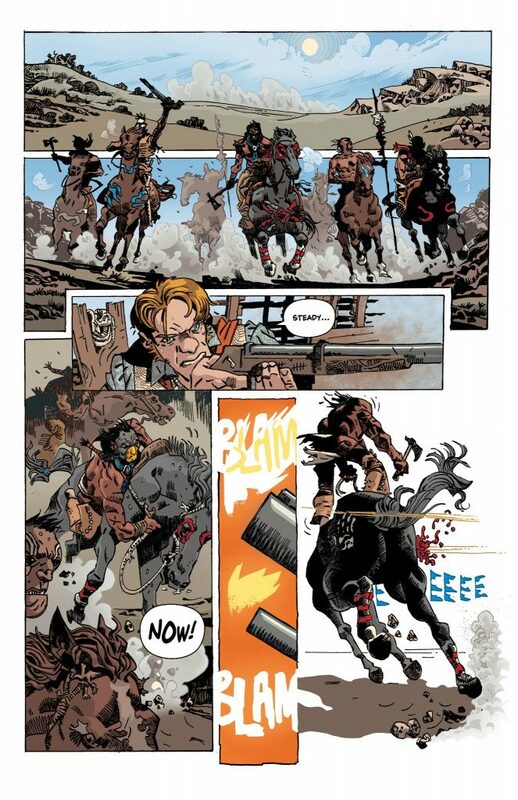 With one final violent act, this sequence sums up Ennis’ wartime thesis: when all is lost, a soldier won’t forget where they come from, or why they fight. IS IT A TKO? Oh, my, yes. As a product, it’s a masterful presentation. As a piece of historical fiction, it’s essential. It doesn’t simply represent the power of the comics medium, it’s indicative of how TKO might move forward as a publisher: Premiere storytellers, immaculate presentation, immediate reader gratification. And Sara takes things even further—it slays you, leaving you quaking in anticipation for what could possibly come next. What publisher would you like to see us cover in the next installment of HOT PRESS? Sound off in the comments, or tag @doomrocket_ over at Twitter.